I fell head over heels for a Zombie. I drove across the state of Georgia to the South Carolina border yesterday to see it in person. The zombie in question is the creation of Lesley at Sweet Freedom Designs. An unfinished project brought back from the grave and given new life as the first in Lesley’s 2012 Zombie Project. 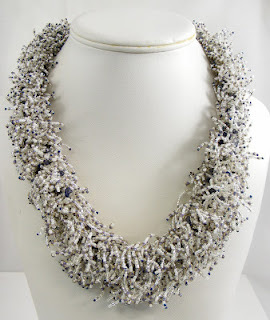 It’s a stunner, sumptuous, lightweight and pure elegance around your neck. I indulged in the luxury of wearing it for a few moments in Lesley’s store, YaYa Beads, in Augusta. YaYa is a creative oasis where inspiration abounds, both in Lesley’s finished pieces and her fabulous inventory. If you’re not yet a follower, click over to her blog – you’re in for a treat! 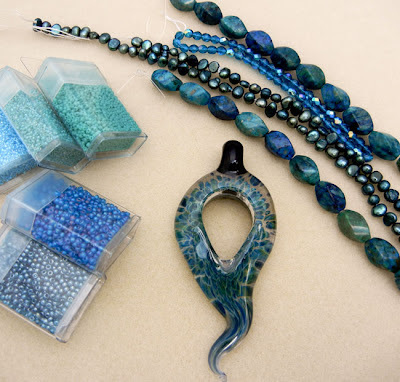 We spent the lunch hour sharing our tentative designs for the upcoming Bead Soup Blog Party. I brought the Fire focal from the Bead Soup bounty I received from Evie and Beth McCord of EB Bead and Metal Works, and we discovered the perfect lampwork beads and pearls to round out my design. My sister, who is my biggest fan, has a birthday coming up, and I knew I would find the perfect focal bead for an end-of-summer necklace. A survey of the store added strands of chrysocolla, pearls and some beautifully reflective firepolish beads for a little extra shine. 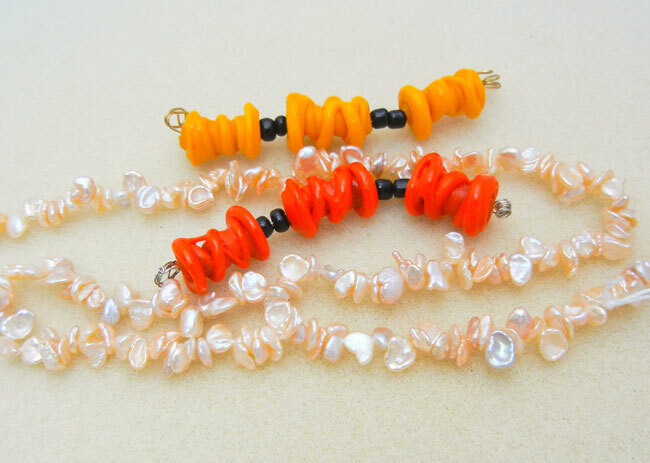 Won’t these look fantastic with a pop of yellow-orange from my stash? Time to head to the bead table. I have some pressing projects – and some Zombies of my own - to bring to life! You are so sweet! I enjoyes our visit, and can't wait to see your finished designs! How nice to hear,that You both have met.Two very much talented Women,whose fantastic creations I can admire. I am very much interestes,which and how many Zombies You are going to return to life.